At Woodland Deck, we take a comprehensive approach to your deck design. 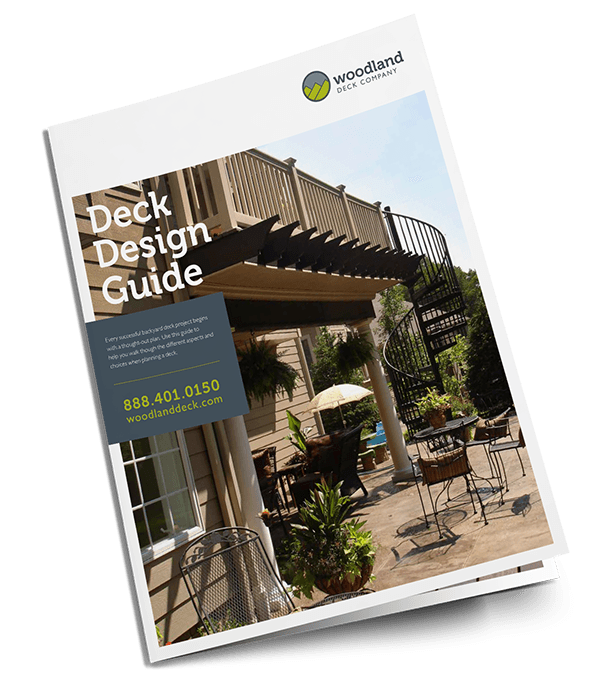 At Woodland Deck, we take a comprehensive approach to your deck design. How will the space be used? How many people do you expect to use it? When will it be used? Have you thought about privacy, shade, or traffic flow? These are all important things to consider when planning a deck project, and we use our creativity and past experience to help guide you through the deck planning stage. If you're thinking about replacing an old deck, it might be time for a deck remodel. We'll delve into the pros and cons of your deck's existing features and work with you to come up with a plan that allows us to reuse or repurpose the existing parts that add the most value - at a cost savings to you. Current deck showing signs of wear and tear? Decks that have surface damage but remain structurally sound make great candidates for deck resurfacing. And at a cost savings to you! Deck and landscape lights illuminate steps and other tripping hazards, but just as importantly, they create ambience by adding a warm and welcoming glow to any space. The Woodland Deck Company has carved a niche for itself in the arbor and pergola building world. We specialize in custom-built arbors, gazebos and pergolas of all sizes. Adding one of these shade structures to your yard immediately gives your home a custom look. It adds function and beauty to your outdoor living space and provides additional shade to leisurely enjoy a good book, or prolong the time spent outdoors enjoying the company of family and friends. Do you have an existing rooftop deck that you love but hate the decking or railing? We also offer rooftop deck resurfacing. This is where the decking and/or railing is removed and the support structure remains if it is in good condition. What you end up with is a new deck on visible surfaces without the cost of replacing the sub-structure. This is a great way to love your existing deck even more. Are you looking for a low-maintenance composite decking product? Do you have an old wood deck that needs repaired? We partner with Trex as a Certified Pro Platinum Installer to offer the full range of Trex products including decking, railing, lighting, pergolas and beyond. Our decks are custom designed to match any lifestyle, whether that means quiet morning cups of coffee or afternoon family picnics. Whether you're planning to build a new structure or you're resurfacing a well-worn space with new decking, railing, and lights, we will work with you to determine the best solution for your needs. While composite decking has been gaining in popularity over the past 25 years, few materials rival the aesthetic beauty and rich texture of real wood. It’s affordable, versatile, and has a classic look that can complement the architecture of any home. At Woodland Deck, we’ve designed and built beautiful outdoor living spaces using both cedar wood decking and pressure treated lumber, and as your deck builder, we can help you decide which type of wood would be the best for your custom deck project. If you haven't had to build or replace a deck in the past 20 years, you'll be amazed at the number of decking options that exist today. Re-decking is an efficient way to restore a deck enjoying the benefits of a new deck without the full cost of a complete teardown and rebuild. Re-decking involves removing your railings, decking, and stairs but keeping the existing structure/frame. There seems to be a lot of confusion about decking products on the market today. While AZEK performs beautifully as a wood deck alternative, it is not considered composite decking. TimberTech entered the alternative, composite decking market in 1997 and like all composite decking manufacturers, they’ve gone through many product upgrades since the first line of TimberTech decking was released.